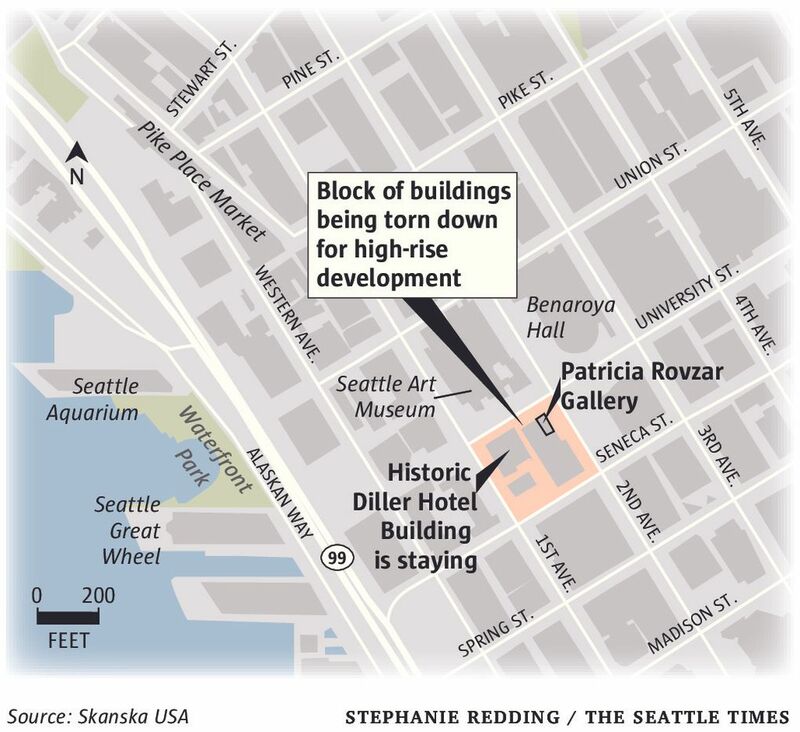 Patricia Rovzar Gallery, a well-known art dealership near SAM, is soon to be displaced by a high-rise — one example of how development is changing Seattle's cultural face. 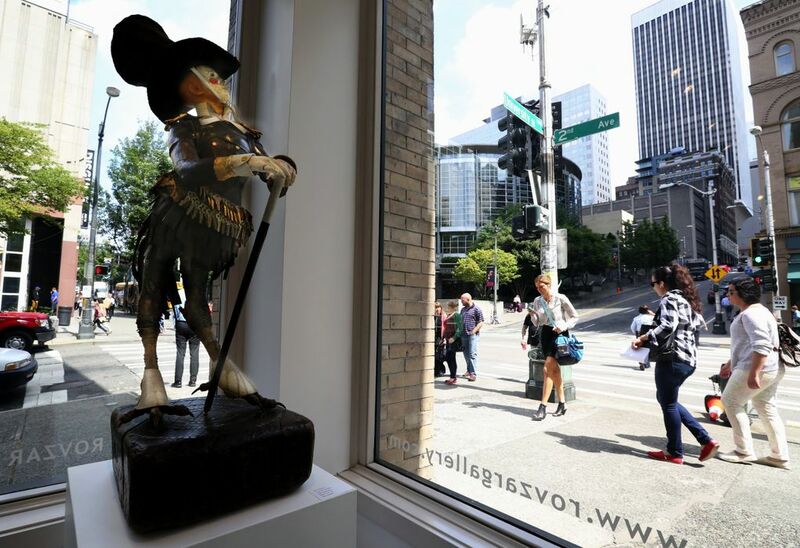 The Patricia Rovzar Gallery sits across from the Seattle Art Museum, at the foot of a steep hill running down University Street from Benaroya Hall. It’s at a breathtaking pause in the momentum of the road before it continues down to First Avenue and the waterfront. To make the most of that exposure, Rovzar keeps the artwork in the gallery lit up until midnight; she’s had collectors and Benaroya patrons thank her for the display. By 2019, though, there will be a dramatically different presence at the intersection. Skanska USA plans to build a high-rise of 30 stories to replace the Galland Building and the Seneca Building. It will balance on V-shaped columns, which will raise the floor of the building 75 to 80 feet above ground and allow it to shelter an open plaza, restaurants and outdoor performance space. Skanska’s goal: Create an office tower above a culturally lively space at what they call the “seam” of business and culture in downtown. It’s just one example of how the cultural face of the city is changing in the current construction boom. 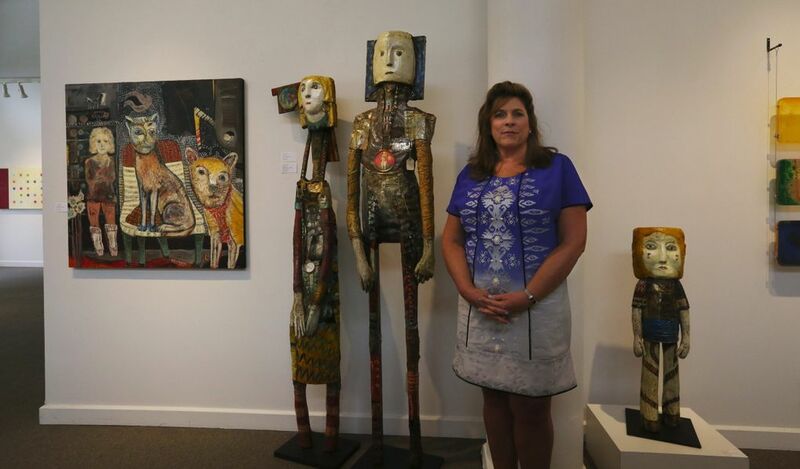 Like many art dealers, Rovzar faces the challenge of seeking a prime location in a city with rents that are “substantially different” from when she moved downtown 10 years ago. Among these challenges are finding an affordable, visible location and the ability to maintain the integrity of the art that is sold. Most tenants of the current building have until next June to move. Rovzar said she’s concerned about rising rents in the area but is willing to accept that it’s inevitable. In the last two years, arts organizations have done a lot “shuffling,” but have not experienced a net loss, according to Matthew Richter, cultural-space liaison at the city’s Office of Arts and Culture. Most have stayed afloat, but the pressure is on them to capture the attention of a wealthier audience, he said. For some art gallerists, a move can be an opportunity to energize their business by re-branding. For three years, Mariane Ibrahim leased gallery space in the Seneca Building, which is adjacent to the Galland Building. When she learned about the Skanska development, Ibrahim searched for new locations and found a former retail site in Pioneer Square with 2,300 square feet of space, more than three times bigger than her former gallery. “The space expands the narrative of the artist … My other space, it was difficult for me to have big pieces. Because then you don’t have enough sort of room to contemplate the piece. So I would privilege smaller,” she said. Over the two-month move and subsequent interior reconstruction, she also built a small, dark room for video screenings and projections. Patrons can pass through to watch videos of artists and videos produced as art (for the new gallery’s opening night, artist Maïmouna Guerresi set up three vats of milk and projected a video that made it seem as if hands were entering and emerging from the milk). Ibrahim also used the move to make the gallery’s name more personal — from “MIA Gallery” to her own name. In the midst of dozens of other construction projects around the city, Skanska said the new building will stand apart from other high-rises by creating a small “village” of restaurants and retail in the plaza. “We elevated the building to essentially create a way to provide a village … that is really kind of reminiscent of what we love about Seattle, our neighborhoods,” said Lisa Picard, Skanska USA’s executive vice president. As Picard sees it, the building will offer gathering space on the street in small porches, but also allow people to have a “quiet moment” in the plaza. “There’s a deep focus on the street and then there’s also this ability to kind of have a bit of an escape from the street,” she said. Skanska has worked with the Seattle Art Museum and Benaroya Hall, along with nearby business owners, for feedback on the design. Simon Woods, president and CEO of the Seattle Symphony, said he looks forward to seeing the outdoor performance space there, and expressed approval for the way the company is trying to connect the business core to the waterfront. Aesthetically, Rovzar wasn’t as sure about whether the concept would work out. A well-known gallerist who has leased the space on Second Avenue for the past 10 years, Rovzar said she would like to stay within two or three blocks of it. Her clientele are mostly professionals who like the dynamic of the downtown scene. In her location directly across from the art museum, she often gets business on Tuesdays, when the art museum is closed. Artist Joyce Gehl, who exhibits work at the gallery almost every year, acknowledged the visibility of the location. She gets frequent calls and texts when her work is showing there. But, like Rovzar, she sees the move as an opportunity to expand the gallery. “Although the location is wonderful in terms of street exposure, it’s a small space, and she has a lot of artists now … I see this as the opportunity for a huge, beautiful new space,” she said.